A boy survives a difficult day with the help of culinary-based words of wisdom in this short children’s book featuring rhymes. 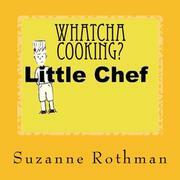 This volume transmits a message of child empowerment through a metaphoric lens of food and cooking. The story begins as a young boy named Little Chef wakes up “very tired one fine morning / And no matter how many pillow stretches he/ did, he couldn’t come unglued. / Today’s picnic basket served up a triple decker/ peanut butter sandwich/ which had already been chewed.” Little Chef’s challenges include a sore nose from being hit by a soccer ball the day before “by a kid who didn’t bother/ to say sorry / leaving on Little Chef’s nose/ a giant meatball stuffed with/ fresh calamari!” (The imagery continues with “Oh, this meatball was/ tender, certainly not slender, / and served with a cold mood milkshake/—fresh from the blender!”) Little Chef bounces happily into class “on giant/ marshmallows,” then realizes he is late: “His paper was bare. / A runaway burnt waffle rolled out of thin air!” The ending, less a wrap-up than a new beginning, finds a girl named “Sous Chef” making a sudden entrance into the narrative. The author’s closing observation: “Sous Chef, whatcha kneading? / Life’s little spoils don’t stand a chance. / The sugary trail of crumbs you leave/ will create an exceptional dance.” Rothman (The Thunder Maker, 2015, etc.) offers children a worthy, uplifting message. Throughout the tale, Little Chef surmounts disappointments by remembering the words that his “family spread/ like thick golden butter on warm yellow/ cornbread/…Little Chef, whatcha cooking/ today? The taste of life is au jus a/ surprise. / Season the day. / Savor the wild thyme. / Make the day sublime!” (This encouraging mantra becomes the story’s refrain.) But overall, both the concept and text would benefit from further development; visual polish would elevate the tale as well. Unfortunately, the volume delivers an off-putting mix of rudimentary graphic design and unappetizing shared stock images. An uneven book that uses food imagery to teach children how to overcome life’s everyday challenges. LITTLE CHEF COOKS I CAN COOK, TOO!